“The Style Issue” with a Kadir Nelson cover — the second Nelson cover in three weeks. It’s titled “Savoring Summer” (and again, I question why the New Yorker‘s covers need to be titled. Shouldn’t covers speak for themselves, so to speak? This cover certainly does). Thinking there’d be a bevy of cartoonists in this mid-September issue (last week’s issue had fourteen), it was a surprise finding nine single panel cartoons this week (there’s a multi-panel “Sketchbook” by Roz Chast). Lately the Monday Tilley Watch has moved away from looking at every cartoon in each issue, but that doesn’t mean each and every cartoon in each and every issue doesn’t receive my undivided attention. Often I look at a cartoon like I eat popcorn. But sometimes I linger on a particular drawing, savoring the art, or the caption (if there is a caption); in the best of times, I linger because I’m happy to be looking at something that works, that really works. Other times I linger out of puzzlement — wondering what I’ve missed about the drawing — how, to my eyes, it went awry (or how my cultural antenna have failed me). It is far more exciting to come across a drawing that soars than one that fails. Take for instance Joe Dator’s three part Beauty and the Beast cartoon in this new issue. I believe the drawing hits the high bar. 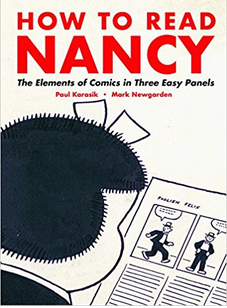 It’s drawn well (it reminds me of Lee Lorenz’s confident energetic art), and it measures up to Peter Arno’s characterization of a good cartoon, landing a one-two punch. A Spill round of applause is in order. Some impressions from the issue: Frank Cotham’s cartoon — it leads off the issue, sitting in a good-sized space following the Table Of Contents. I mentioned Mr. Lorenz’s confident drawing; in Mr. Cotham’s quarter century of contributing to the New Yorker, he’s shown no fear in taking on the big picture, and handling it well. Alex Gregory’s line (his drawing is on p.93) is always a welcome sight. Ed Steed’s bee-hive wielding doctor drawing (p.55) seems like a follow-up to Zach Kanin’s memorable “I can feel the baby kicking” cartoon from 2008. Cartoon caption contest drawings aren’t mentioned here much, but I did note that Mick Stevens’ drawing this week echoes one of mine (captioned as you see) published in The New Yorker, August 23, 1982. Saturday, the 6th: Sh!t Show: A Parenting Comedy Revue (with, among others, Emily Flake, and Roz Chast). The New Yorker‘s cartoon editor, Emma Allen presents Instagram’s most liked New Yorker cartoons of 2017 (by # of Instagram likes, of course). The list includes cartoons by (in no particular order here) : Farley Katz, Peter Kuper, Liana Finck, Paul Noth, Jeremy Nguyen, Roz Chast, Ben Schwartz, Kim Warp, Mort Gerberg, Emily Flake, Charlie Hankin, Alex Gregory, Maddie Dai, and Lars Kenseth. I believe these cartoons are a mix of work that appeared in the print version of the magazine or in the online only Daily cartoon slot. See them here! Yet another fun & fascinating installment from this site. Read here. 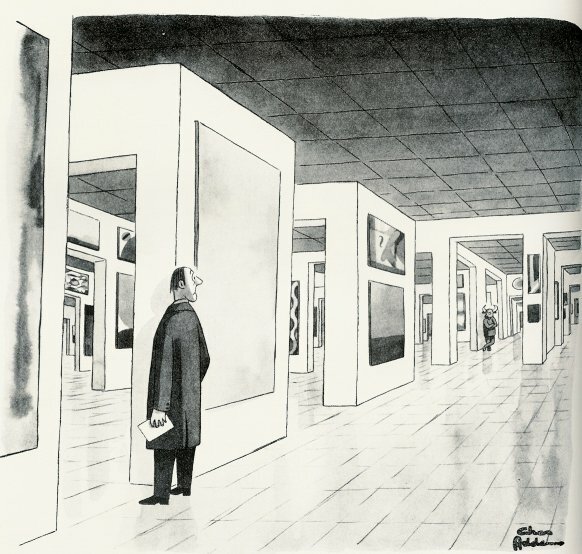 I won’t lie to you Spill visitors, the first time I saw a Lars Kenseth drawing in the New Yorker, I was both baffled and intrigued. No one draws like Mr. Kenseth. He is one of the newest of the newest wave of cartoonists who have broken into and onto the pages of Harold Ross’s now 92 year old weekly. Mr. Kenseth’s first drawing appeared last Fall and those that have followed have not lost their peculiarity. That’s a good thing. Happily, I had the opportunity to meet Mr. Kenseth this past Spring when he was east. Meeting him was in a weird way like meeting his cartoon world; cartoonists who seem like their worlds fascinate me (two of the New Yorker cartoonists he mentioned in our discussion qualify as perfect examples: Sam Gross and Charles Addams). Michael Maslin: According to your website bio you are a very very busy cartoonist. So, what are you up to these days? Lars Kenseth: The project that’s giving me the most stress dreams right now is an animated show I created for Adult Swim called Chuck Deuce. It’s about this sketchy, burnout surfer from Santa Cruz who is terrorized by a bevy of weird, pervasive hallucinations. We did a pilot and it’s about to go into “testing” which means they’re going to screen it for a roomful of people in Union, New Jersey who will then decide if I should be on the TV. Fingers crossed. At the same time, I’m trying to sell four other TV projects and a movie. The thing about Hollywood is… nothing is real. I can’t tell you how many times I’ve been told something is a sure thing only to see it fall apart. Which is why I’m always working on new material. The upside is I’m usually employed. The downside is I’m more panic attack than man. But that’s just great cartoon material. I’ve also started writing short comedy pieces, a la Shouts & Murmurs. I’ve always loved short form stuff like that. I’m a HUGE Jack Handey fan. Anyway, it’s something I’ve always wanted to try. And I just sold one to The American Bystander! That was exciting. I love that magazine. MM: You’re a west coaster, and you’re also involved in television. Do you ever interact with other west coast New Yorker cartoonist / television colleagues such as Alex Gregory, Bruce Kaplan, and Zach Kanin? LK: I haven’t met Alex or Bruce yet. Although I would love to, I’m a giant fan of them both. I’ve met Zach Kanin once – very nice guy and also insanely busy out here. And I know Sam Marlow’s out here, too – I need to reach out to him. Sam, if you’re reading this, drop me a line. Matt Diffee and I are great friends and we see each other often. We are both members of The Order Of Cornelius (the NCS – L.A. Chapter) where we do secret handshakes and wear plaid and talk about cartoons. It’s fun! Matt was a huge help as I was shaping my drawing style. 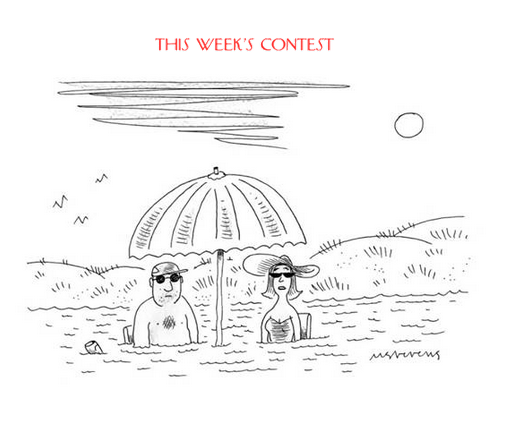 MM: You have one of the most unusual styles of all contemporary New Yorker cartoonists. Can you talk about your style. LK: Can I just say, I LOVE hearing people try to describe the characters I draw. I’ve heard everything from deodorant roll-on people to egg people to blobs to Weebles to gel caps to jellybeans to lozenges – it’s like the way every clan of survivors in The Walking Dead has a different name for “zombies”. Ever since I was a kid I’d always drawn friendly looking characters, it’s what I like to do, but when I started working in TV animation that clean, big eyed look really snaked more and more into my drawings – because if I wanted to sell an animated show it would have to look like what’s on TV. When I finally got the courage to start submitting to The New Yorker, I knew I had to switch up my style. Matt Diffee put me through a kind of cartoon boot camp – feeding me different reference material. Weird Iranian cartoons, 18th century French doodles, etc. I just took it all in and started grinding away on a new style. 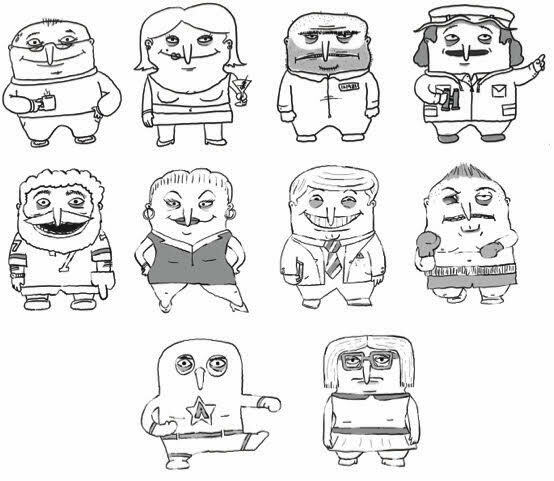 I started drawing these strange little characters – my lumpy guys, I called them. They were squat, blobby characters with long pointy noses, bags under their eyes and I was using a rough, glitchy line quality. I thought I found something kind of interesting. Eventually I flew out to New York to meet Bob [Mankoff, the New Yorker’s cartoon editor from August 1996 – April of 2017], introduce myself and get some face-to-face feedback on my stuff. Bob liked my jokes, but he HATED my style. It was the pointy noses that really did it. When I got back to L.A. I took a hard look at my cartoons. The thing that I realized was these characters I was drawing weren’t me. They were mean and tired looking. It didn’t fit with my jokes or my personality. What I did like was the line quality. So I kept that. But from there I went friendlier, softer and pulled back on all the extremes. And that was that. After a month I’d rehabilitated my style to something that, thankfully, has found favor at the magazine… or at least enough favor to get the occasional OK. And I love it. MM: I think you may have made New Yorker cartoon history by including the words “New Yorker Cartoon” within the cartoon itself, and (unless I’m wrong), it was your first New Yorker cartoon. Can you talk about that cartoon, and about that “first” moment? Every cartoonist remembers that moment of the first OK. Can you share your memory? LK: What a delightful shock that was, haha. I still have to pinch myself sometimes. As far as that first cartoon goes – I can’t believe I even sold that one. The whole “creepy clown” phenomenon was so odd – and not “New Yorker” at all. But, it’s a therapist’s office scene, so that’s the tether I suppose. It’s fitting that was my first one because some of my favorite New Yorker cartoons marry the surreal with the everyday. I’m reminded of that Charles Addams cartoon where a security guard locks eyes with a minotaur in the center of a labyrinthine museum. I need to sell a minotaur cartoon. For a kid whose father started feeding him Charles Addams and Sam Gross cartoons at a frightfully young age, this was a landmark moment. Note: I asked Mr. Kenseth if he wouldn’t mind drawing a deodorant guy for the Spill. He happily obliged and sent what he called “a little self portrait” — it appears at the very top of the post. A new feature in the new week. Around here at the Spill this roller coaster cartoon life begins anew every monday with the publication of the latest issue of the New Yorker. The latest issue is the klieg light for cartoonists; we go to it with some higher level of curiosity: to see who’s in and what our colleagues have come up with; to see, and yes, judge, whether we believe the work is great, good, bad, or so-so; whether there’s a just published drawing exactly like the one we were about to submit; whether there’s a drawing we’ll never forget, or never remember. I’ve always thought of every new issue’s cartoons as fuel — whether I like what I see or dislike it, it somehow gets the new week going…with a bang. 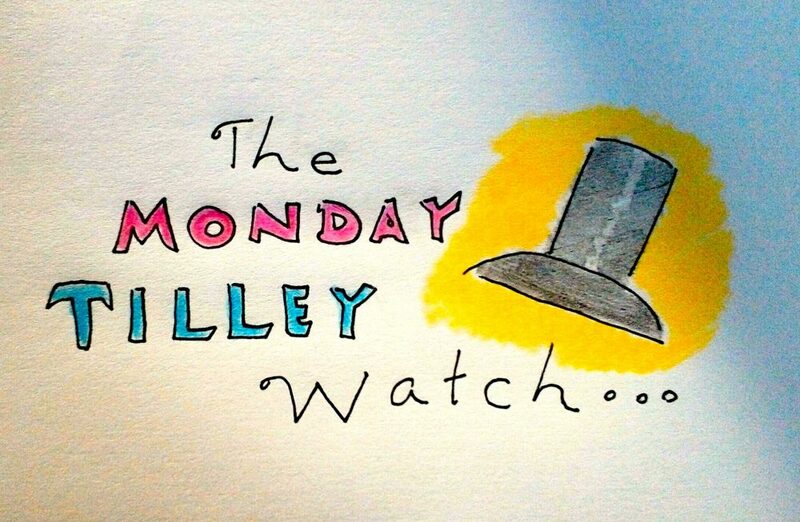 The Monday Tilley Watch is a look at the latest issue. I’ll record whose work we see, and whatever peripheral thought about the cartoon or cartoonist hits me at the moment. I’ll likely wander into other departments as well (at least mentioning the Art Department’s baby: the cover). It is not at all like what my friends over at the Cartoon Companion do. They dissect each cartoon and then rate it, bringing an objectivity to this party I can’t (neither of the Cartoon Companion fellows contribute to The New Yorker…yet). … We begin with a political cover by Barry Blitt (surprise!) featuring the President and two of his children — the cover was already mentioned, and shown here at the end of last week…I note on the Table of Contents that there are no special cartoon features this week (no full pages…at least, none listed here… no spreads, etc. )..and then onto The Talk of The Town, still headed by the newly modernized Rea Irvin masthead. I’m going to keep wishing the previous masthead returns — the one that was in place for 91 years. The magazine has, in very recent times, tried out redesigns up front only to pull them back. If only it would happen here. I also note on the Talk page that there’s a wonderful Tom Bachtell drawing of the President and his in-the-news son; Donald and Donald, Jr. making their second appearance in the issue and we’re only 15 pages in. …Mr. Steed’s drawing is followed by the veteran, Roz Chast (her first cartoon was published in the magazine in 1978). I love how this particular cartoon looks on the page (yesterday’s Spill concerned itself with placement). William Haefeli‘s drawing is next (first New Yorker drawing: 1998). Mr. Haefeli has one of the most distinctive styles of this current stable of cartoonists. And speaking of distinctive styles, Drew Dernavich has the next cartoon. Some cartoonist’s styles are easily summarized (“the dot guy” for instance) — Mr. Dernavich’s tag might be “the woodcut guy.” (Mr. Dernavich should not be confused with John Held, Jr., the New Yorker ‘s much earlier “woodcut guy”). A Robert Leighton cartoon is next. Mr. Leighton is the artist behind this classic cartoon. 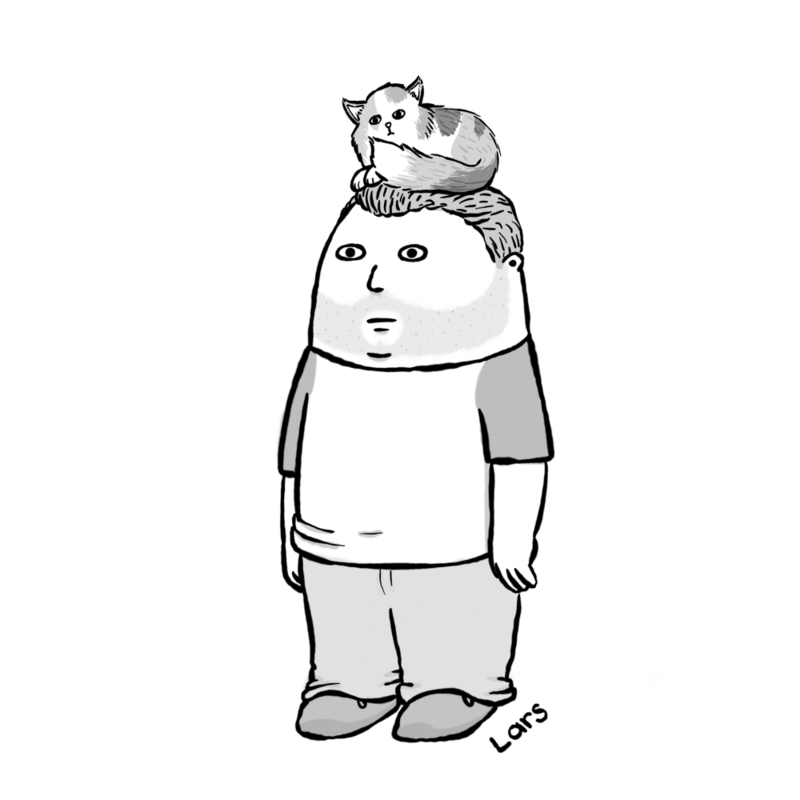 His first drawing appeared in The New Yorker in 2002. In this new drawing he mixes crime with a food cart. Alex Gregory’s very Summery drawing follows. Mr. Gregory, like a few other cartoonists, has another whole career: he’s a writer for the award-winning televison show, VEEP. 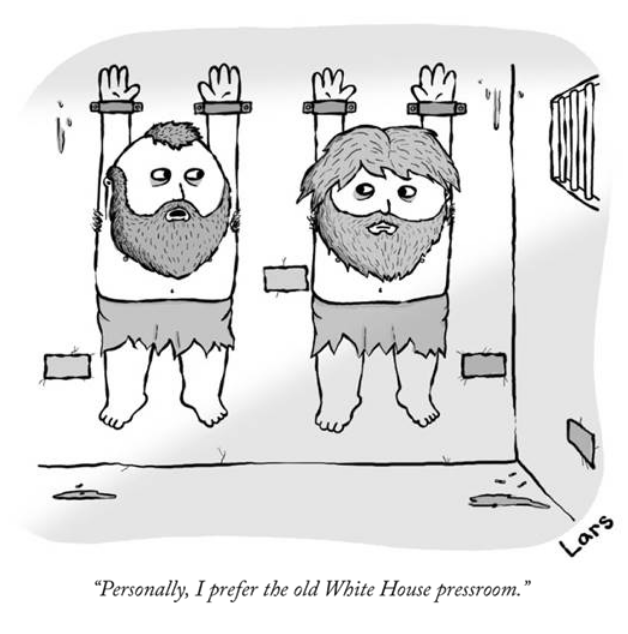 His first New Yorker cartoon appeared in 1999. As usual, The Cartoon Caption Contest ends the issue. Drawings by David Borchart (first New Yorker cartoon published 2007), Tom Cheney (first New Yorker cartoon published 1978), and P.C. Vey. The drawings feature a food cart (two food carts in this issue! ), a whole lot of business men following some ancient warriors on horses, and a hospital scene that blends in a little stadium gear. 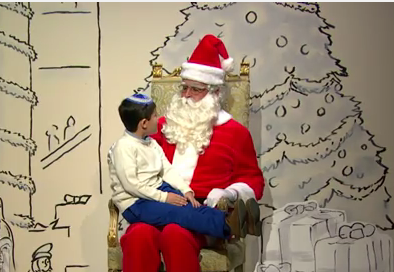 The New Yorker’s editor, David Remnick has returned to NBC’s “Late Night with Seth Meyers” to interpret a number of New Yorker cartoons brought to life. The live cartoons are (from top to bottom) by Alex Gregory, Paul Noth, Harry Bliss and Tom Toro. Watch it here.